HUGE news, alternative metal fans!! 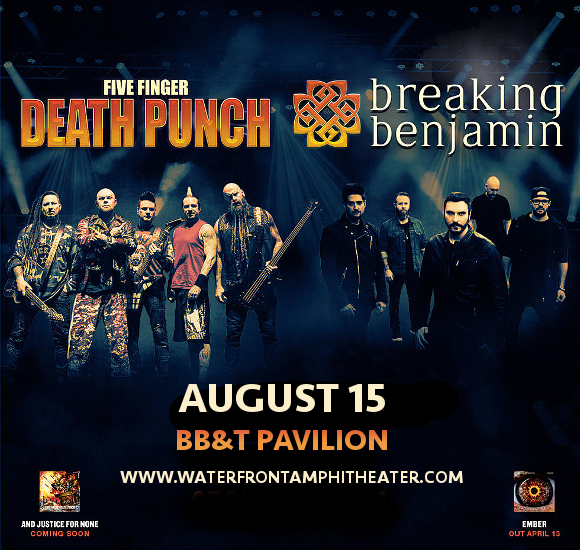 Five Finger Death Punch and Breaking Benjamin are teaming up for a massive north American tour, coming to the BB&T Pavilion on Wednesday 15th August 2018 with upcoming new albums each!! It’s going to be epic – grab your tickets NOW while you still have the chance!! Breaking Benjamin’s new album is entitled “Ember.” Breaking Benjamin’s last album, featuring an almost entirely new lineup aside from frontman Benjamin Burnley, was written entirely by Burnley, but a collaboration towards the end of the album’s completion has resulted in a far more collaborative effort from all band members on the new album – including sharing vocal duties! Get ready to experience the whole new Breaking Benjamin live – grab your tickets today! !